An appeal (p.a. 2014/7103) has been lodged at the beginning of July by the developers against Wandsworth Planning Application Committee decision to refuse their plan to redevelop 98 York Road with a podium and buildings up to 17 storeys. 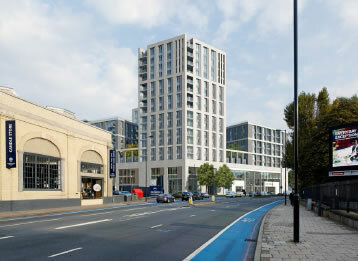 It seems that the main reason why the Conservative member approved one scheme and rejected the other is that developers of 98 York Road were not cynical ingenious enough to offer the relocation of a similar asset as the Royal Academy of Dance (of course some would say also that as it was presented before the May general election, Tory councillors did not want to alienate the voters…), which would have been the key element to ignore all breach of policy, objections of neighbourhood and harm to the amenities.